Public Relations should be viewed as a tool for engagement and brand building. At the American Association of Advertising Agencies’ (4As) PR conference, industry thought leaders and influencers came together to provide their views on emerging trends influencing PR in the digital age. I want to recognize 4A’s information specialists Rebecca Samson and Christine Pelosi for pooling their impressions from the conference and drafting their original observation document. Below is my interpretation of these themes and how they could affect aviation marketers. From Jet Blue to Google to IBM, three areas emerged that aviation marketers should consider when developing public relations and social media plans. Thomas Gensemer, Managing Partner, Blue State Digital, focused on changing role of today’s influencers. No longer are celebrities and urban cities setting the trends. Influencers can come from anywhere, aided by accessibility and quick distribution models of social media. Participation: Encourage supporters to become involved in a campaign using real-time and digital events. Integration: Integrating both traditional and digital media into the campaign allows the brand message to reach the largest possible audience. Celebration: Social media has given fans a chance to enter the conversation and have a hand in trend-setting. Jet Blue communications team attributes the airline’s focus on transparency, both internally and externally, as one of the key factors responsible for building the Jet Blue brand. Externally, Jet Blue has an excellent crisis management strategy in which it responds quickly and truthfully to issues while updating information frequently, using multiple social media platforms and networks. 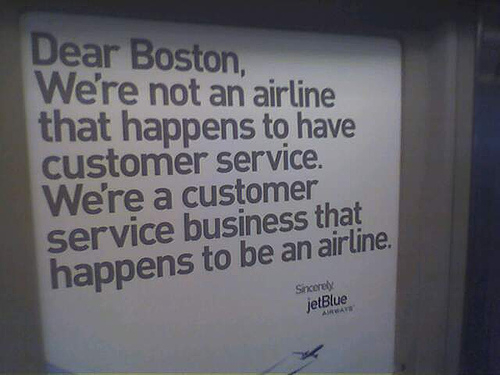 Internally, Jet Blue practices open communication between management and employees. By implementing companywide email, internal Facebook pages, and having a CEO actively posting to his Twitter account, Jet Blue engages employees in day-to-day issues. Such transparency enables employees at all levels to become brand stewards. They are trained on the Jet Blue brand story, empowering them with knowledge to serve their customers as the company serves its employees. Ingrid Bernstein, Director of Experience at J. Walter Thompson (JWT), touched on the theme of brand journalism. Digital distribution has created a world of fast news cycles, decreased attention spans, and brands have less control over their story. Ingrid suggested that, in response to these factors, brands practice brand journalism – an editorial approach to brand-building that uses journalistic practices and assumes non-fiction stories can be more interesting than fictional ones. The goal of brand journalism isn’t to sell products but rather the brand’s expertise. Access = success. Give people access to the story behind the scenes. Don’t be afraid to show difficulty. Obstacles can be framed as opportunities for transformation. Drama comes from conflict. Setting up tension gives people a stake in the story, driving engagement. Transparency is powerful. Transparency is a storytelling device influencing the emotional connection with the brand. Embrace the trolls. Listening to and engaging your detractors can help develop the brand story. Identify and follow characters. You may not know who they are, but always be on the lookout for them. Show passionate customers. Integrate brand advocates into your story. Leverage good news. Connect with the news cycle and be responsive. Create an empowered approval team. Develop a rapid approval process with high-level executive involvement.